The recent Golden Globe Awards show, held in Los Angeles, proved to be a perfect event for showcasing MODE AUDIO’s FILA line array loudspeakers. The show was broadcast and live streamed worldwide from the Beverly Hilton Hotel’s International Ballroom. Host Seth Meyer kept things lively as the awards for excellence in film and television were presented. 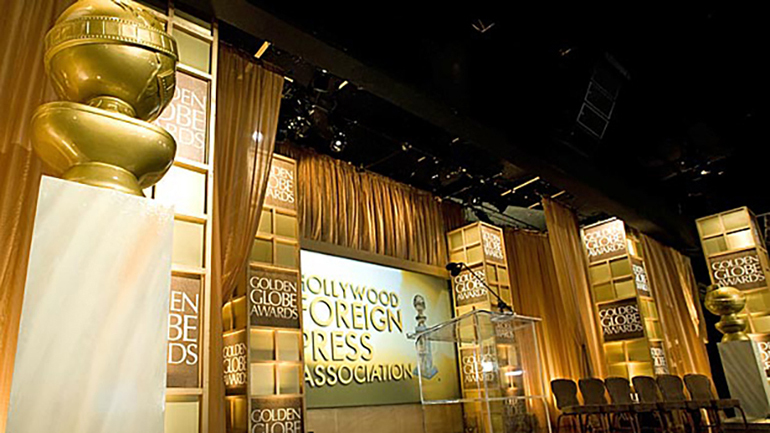 Known as the “fun award show,” statues are awarded based on voting by the Hollywood Foreign Press Association. The tone and overall vibe of the show may be lighthearted but the single Schoeps microphone that was raised and lowered from the stage for the presenters gave a laser focus on the need for excellent audio throughout the ballroom. A veritable who’s who of movie and television stars needed to be heard clearly through the sometimes-raucous audience. Three FILA 10.1 boxes per side were flown, providing ample headroom and coverage for the presenters and recipients’ speeches while a single BPM-218subwoofer per side handled low end needs for the walk-on and walk-off music. Each FILA box contains a single 10″ neodymium woofer that creates an optimal combination of low and mid-range frequencies due to its MODE Audio Phase Plug. In addition, two high output neodymium compression drivers are mounted on its patented LSM® MODE AUDIO “chamber line wave guide” for high frequency. The sub cabinets each house dual high power 18″ neodymium speakers. Amplification was handled by the MODE V-Series power amplifiers.